Don't miss this book! Beautiful layout with wonderful photos of artists' artwork, and secrets revealed with interesting quotes and answers. In depth and very personal thoughts shared; to be treasured by all who aspire to gaining insight into the creative process...I have the honor of being included in this book...Click above link, go to Amazon link for inside look. I would like to be an organic farmer, if I wasn't an artisan. Some offerings from our small backyard garden. The arugula is still green and grows like a weed! It is so rewarding to grow some vegetables. The red kale is very tasty. This photo was taken from my backyard this summer. The colors never cease to amaze me and I have lived here for 23 years. The photo isn't enhanced. Just a small digital camera. 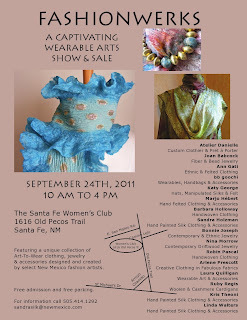 One day show, September 24th, 10am-4pm at Women's Club, Santa Fe, New Mexico. 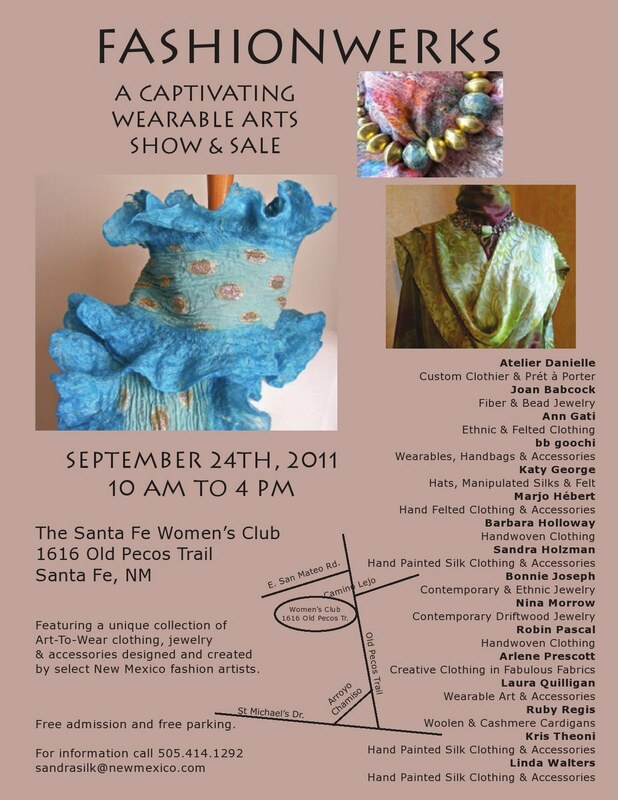 A dazzling array of New Mexico fiber and jewelry artisans. Detail of painting. I use dyes, paint brushes, foam brushes and a brush that was a broom. Hand painted silk crepe de chine kimono. One size. I tried a different camera for photos and the results were fairly good. Hand painted silk crepe de kimono..now on it's way to North Carolina. Silk scarf, satiny, smooth 15"X72" in fall palette; chocolate, slate, and adobe. Here is new piece that I sent to North Carolina..just in time for Earl! Hope all the Ocracoke Islanders stay safe. It will reside at Island Artworks on Ocracoke. It's a deep luscious cool tone piece, M/L, with black velvet band and cuffs. 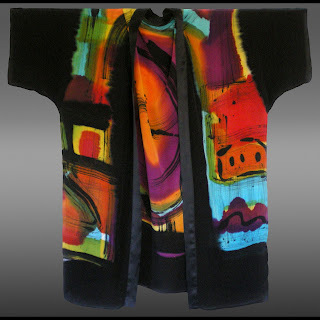 I invite you into my art to wear blog.. 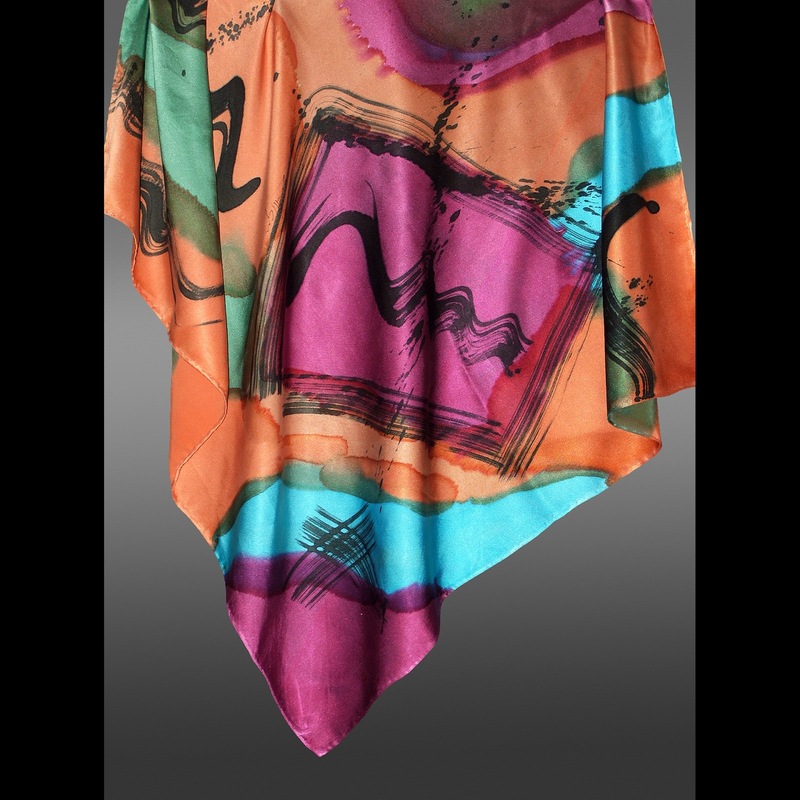 Please explore the colorful palette of my art to wear collection. I live in Taos, in Northern New Mexico; a place that has inspired artists & artisans for several hundred years. The expansive blue skies, vivid sunsets, and earthen arroyos influence my color choices. Each piece is hand painted in related editions. The dyes I use are low impact & eco-friendly, while my technique excludes the use of wax as a resist eliminating dry cleaning to remove wax. Watercolor effects infuse the surface generating abstract designs & floral motifs as I apply the dyes with Chinese, foam, and broom brushes. The fabrics I use are silk and velvet. 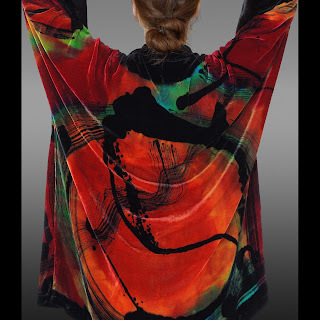 Above photo; Hand painted velvet wrap in cool tones, 20"X90". 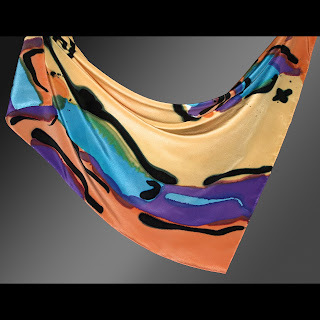 As one in an edition; silk crepe de chine scarf, 14"X72", color stream flowing in middle of piece. A watercolor application suggesting a river of color. Brushes are used to create the affects. Hand painting! Here are the details for jewel tone kim. This is a fresh new jewel tone kimono, size m/l. 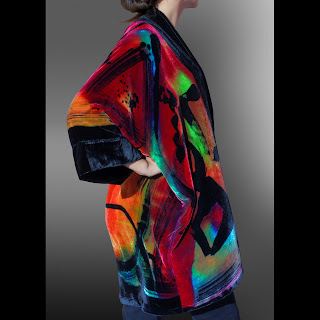 I have painted many of these abtract motifs creating a soft but dramatic garment. I have included a close-up of the brush work and details. This silk chiffon kimono reminds me of the colors of a Taos New Mexico sunset. I overdyed it pale pink to tone down a brighter green. Overdyeing gives me the opportunity to save or enrich a piece..love it. This kim is a M/L size. So really nice for warm summer days; weddings, pool parties, evening outings, anything fun. Namaste.